Falling off very early in the season or stage of development of an organ. Containing calcium carbonate (lime), usually referring to soil or bedrock. 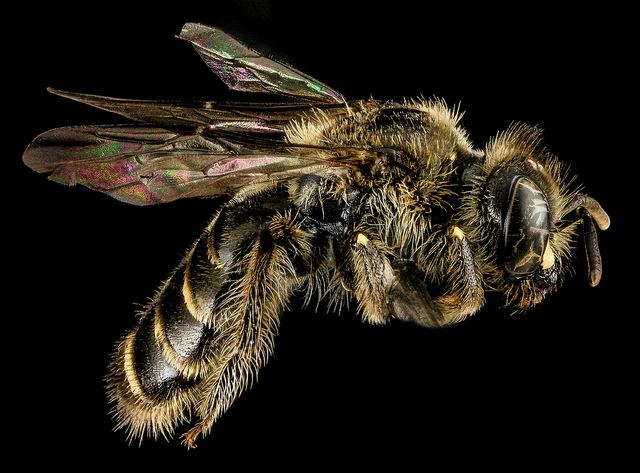 Campus Bee, photo USGS Native Bee Inventory and Monitoring Laboratory. With a thick, firm texture. A crest or fleshy outgrowth of the lip. With a set of small bracts at the base of an involucre. The outer whorl of floral organs, usually consisting of sepals. Species for which there is sufficient information on their biological status and threats to propose them as endangered or threatened under the Endangered Species Act, but for which development of a proposed listing regulation is precluded by other higher priority listing activities. Convex removable portion of a plant part. Abruptly expanding at the apex, like a knob. A group of capitula or heads (infloresences of Asteraceae). A type of inflorescence, found mostly in the Asteraceae (aster family) composed of many flowers on an expanded receptacle. 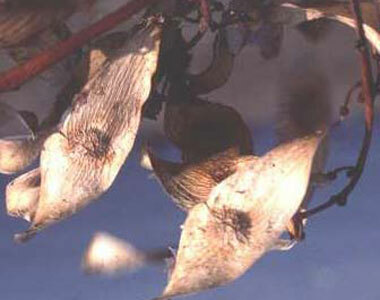 A dry, dehiscent fruit that opens along two or more seams to release two or more seeds. One type of highly modified leaves of a flower, bearing the ovules and usually composed of an ovary, style, and stigma. A type of achene in grasses, in which the seed coat is joined to the pericarp. Ament: a slender, usually pendulous inflorescence, with crowded male or female flowers. With a tail-like basal or terminal appendage. A hardened summit of a root mass, which usually survives the winter. In some horsetails (Equisetum species), the main hollow center of the stem. 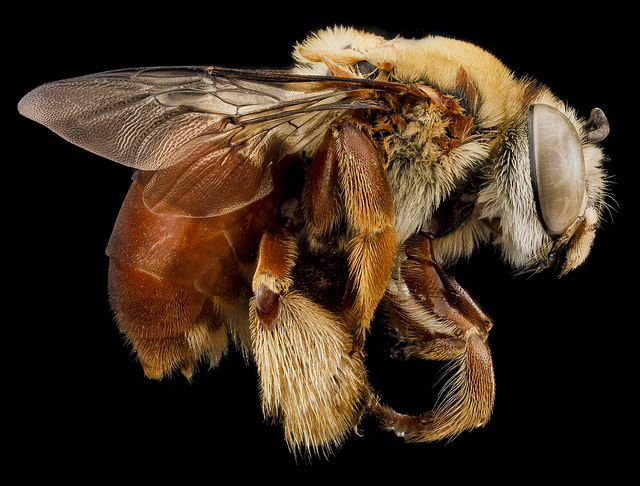 Oil-collecting Bee, photo USGS Native Bee Inventory and Monitoring Laboratory. 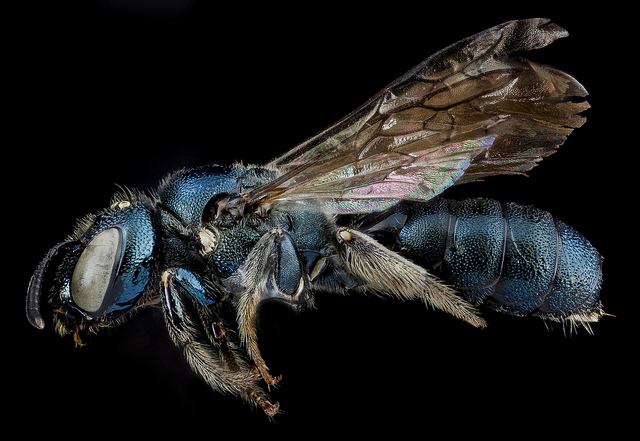 Carpenter Bee, photo courtesy Packer Laboratory, York University with assistance of Robert and Cecily Bradshaw and Canadensys. 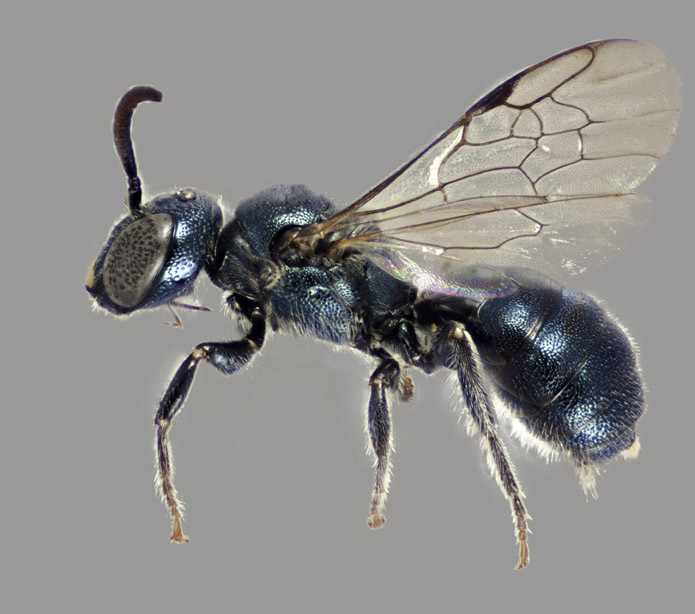 Small Carpenter Bee, photo USGS Native Bee Inventory and Monitoring Laboratory. Growing in dense clusters, as a clump or tuft (alternate spelling: "caespitose"). Small, papery scale, often associated with the base of a ray floret in Asteraceae. Interior branchlet tissue divided into many empty horizontal chambers by solid cross partitions. With the texture of paper. Flowers that are pollinated when they are open (opposite: "cleistogamous"). The pigment that gives a plant its green color and absorbs light energy, the first step in photosynthesis. Containing chlorophyll and therefore capable of photosynthesis. Hairs found at the margin of an organ. With hairs (cilia) at the edges. Coiled inward upon itself, like a fern crozier or some tendrils of vines. An encircling region of habitats between the temperate zone and the Arctic. 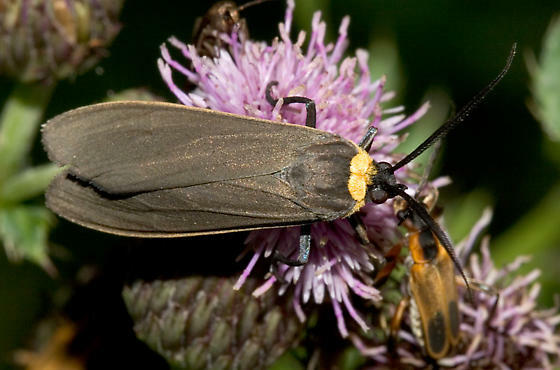 Yellow-collared Scape Moth, photo ©Mike Boone, BugGuide.net . Closely surrounding the stem, as when the bases of a leaf almost meet on either side of the stem. Widened at the distal end, like a baseball bat or club. A narrowed portion at the base of an otherwise flat structure, such as a petal. Flowers that self-pollinate when they are still closed (opposite: "chasmogamous"). 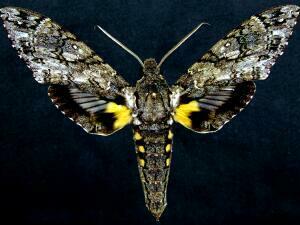 Giant Sphinx Moth, photo ©Jim Vargo, North American Moth Photographers Group. When organs such as the leaves and flowers expand at about the same time. The sheath of tissue that protects the emerging shoot of monocots. 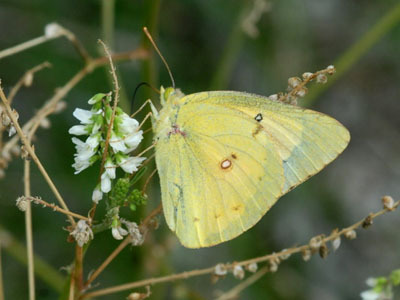 Clouded Sulphur Butterfly, photo ©Herman H. Giethoorn. .
An extra bud placed next to a bud on the side of a branch. Forming clusters of plants by vegetative spreading via rhizomes or stolons. A cylindrical body formed by the fusion of organs; in orchids, the central body that contains the styles and stamens. A tuft of hairs resembling a tail; a structure in seeds that aids in dispersal. The surface where two carpels cohere. With a tuft of hairs (coma), usually referring to a seed. Comprised of multiple separate parts. A leaf that is divided to the midrib, with distinct, expanded portions called leaflets. Folded lengthwise into equal parts. Shaped like a cone (3-dimensional triangle with a round base). A cone-bearing seed plant with vascular tissue; a gymnosperm. Two similar organs are fused, grown together, or mutually attached, such as flower petals fused to form a corolla tube. Touching, but not actually joined, referring to two similar organs. Petals or sepals that overlap their neighbors on one side, and are overlapped by another neighbor on the other side. Curving or bulging outward, like an upside-down U. Each petal, sepal or leaf overlaps most of the next, so the whole structure (usually in bud) looks like a closed umbrella. Heart-shaped; with a rounded lobe on each side of a central sinus. With a firm, leathery texture. Underground storage organ that is not enclosed by leaves (i.e., of some orchids). The second (inner) whorl of floral organs, enclosed by the calyx, often consisting of petals. A series of appendages forming a "crown" on the corolla or achene. A sticky gland to which a pollinium is attached (in the Apocynaceae). 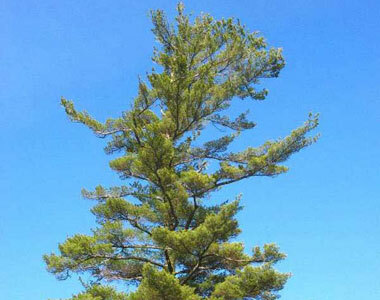 An indeterminate inflorescence that has long lower branches and progressively shorter upper branches that create a more or less flat-topped shape. 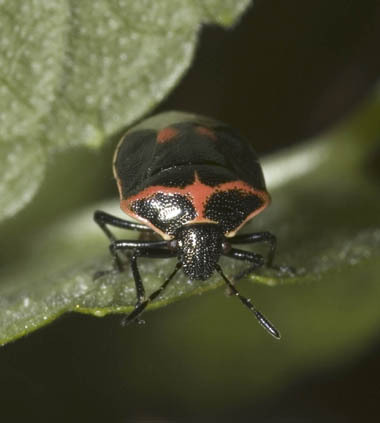 Twice-stabbed Stink Bug, photo ©Susan Ellis, Bugwood.org. The midrib of a fern pinnule. The first leaf produced by the embryo before the true leaves begin to grow after germination. Growing along the ground, sometimes rooting at intervals. With fine rounded teeth; finely crenate. Covered with crest-like ridges; usually refers to the texture of a quillwort (Isoetes) megaspore. A summit that is surrounded by a lobed or toothed rim (usually refers to a pappus). 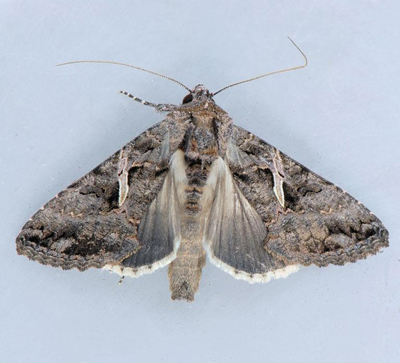 Sharp-stigma Looper Moth, photo ©Mark Dreiling, Bugwood.org. Stem of a grass (Poaceae) or sedge (Cyperaceae). Wedge-shaped; tapering to the base with relatively straight, non-parallel margins. A cup-like involucre with the flowers inserted on it (in Euporbiaceae). Whorl, usually referring to series of structures such as petals or sepals in a flower. Shaped like a soda can, with parallel sides and circular ends. Flower cluster (inflorescence) with stalks (pedicels) on the individual flowers, usually broad and rather flat. Middle flowers usually come into bloom first, which causes the stem to stop growing (it is determinate). A special type of achene that has a pappus (a bristly or scaly structure formed out of the calyx) attached to the apex, found in species of the Asteraceae and Caprifoliaceae. Dots of calcium carbonate found on some leaves of the Urticaceae.